Local solar energy developer Solar Philippines has unveiled plans to build one of the world’s largest solar panel factories in Tanauan, Batangas. 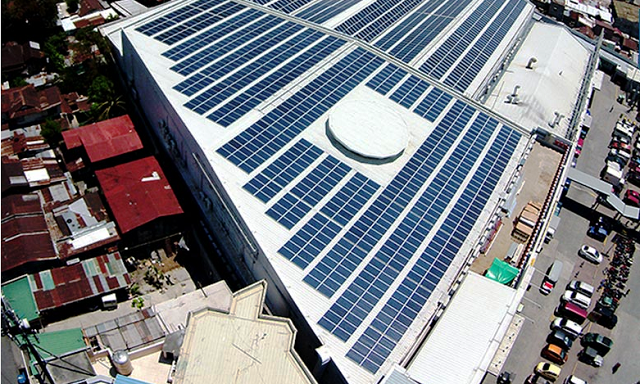 The facility—which will be completed in three years—will be designed for an eventual capacity of 2 gigawatts, with the first section scheduled to start operations by end-2016, Solar Philippines said Wednesday, June 1. The new project is seen to create more than 6,000 direct and 20,000 indirect jobs, and operate on 100% solar power. Senator Miriam Defensor-Santiago was rushed to the intensive care unit of Makati Medical Center on Monday night, her husband Narciso “Jun” Santiago Jr announced Wednesday. Santiago intends to keep her confinement as private as possible and refuses to accept gifts from the public. Santiago said then she was taking anti-cancer pills that nursed her health back to normal, and added the cancer cells are getting smaller, because they are allegedly as disciplined as she is. Due to her medication, she was unable to attend the second leg of the presidential debates on March 20 of this year. Santiago said in a letter sent to Senate President Franklin Drilon on May 24 that she developed anorexia (inability to eat) as a side effect of one of her anti-cancer medications.